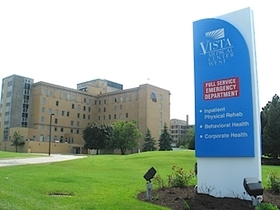 Vista Medical Center West in Waukegan, Ill., might be bought by a for-profit behavioral health company. Vista, one of two hospitals in Vista Health System, disclosed the potential sale to US HealthVest in a new application to the Illinois Health Facilities & Services Review Board, which regulates health care construction and must approve the sale. Vista also requested to discontinue its 25-bed rehab unit, which was temporarily closed last month due to low volume and concerns about staffing availability, the application said. A spokeswoman for Vista did not immediately return a message to comment. Richard Kresch, president and CEO of US HealthVest, declined to comment. The proposed deal comes about four months after longtime Vista Health System CEO Barbara Martin left her post. She oversaw a small community network with far fewer dollars and more low-income patients than rivals. US HealthVest has a total of four psychiatric hospitals: two in Georgia, one in Washington and one in Des Plaines (Chicago Behavioral Hospital), according to its website. In June, the company and Silver Cross Hospital received approval from the facilities board to build a 100-bed, $24 million behavioral health hospital in south suburban New Lenox. In its new application, Vista said the rehab unit that was temporarily closed in August would be used to expand the facility's psychiatric beds. The proposed new owner would apply to "modernize and expand the Vista West's physical plant and psychiatric bed capacity," the filing said. Vista noted to regulators that three other hospitals within 45 minutes provide acute rehab services, and many long-term care facilities offer short-term rehab. Vista was part of Community Health Systems, a national for-profit hospital chain, until last year, when the system was among about three dozen medical centers nationwide that were spun off into a new company called Quorum Health. "Vista​ hospital​ in​ deal​ to​ be​ sold​ to​ for-profit​ psych​ firm"​ originally​ appeared​ in​ Crain's​ Chicago​ Business.